The "Sabbath rest" was intended to be a time to remember and celebrate God's goodness and the goodness of his work, both in creation and salvation. It was a day set apart for the praise of God, his work of creation, and his saving actions on our behalf. It was intended to bring everyday work to a halt and to provide needed rest and refreshment. Jesus' disciples are scolded by the scribes and Pharisees, not for plucking and eating corn from the fields, but for doing so on the Sabbath. In defending his disciples, Jesus argues from the scriptures that human need has priority over ritual custom. In their hunger, David and his men ate of the holy bread offered in the Temple. On every Sabbath morning twelve loaves were laid before God on a golden table in the Holy Place. Each loaf represented one of the twelve tribes of Israel. No one was allowed to eat this bread except the priests because it represented the very presence of God. David understood that human need took priority over rules and ritual regulations. 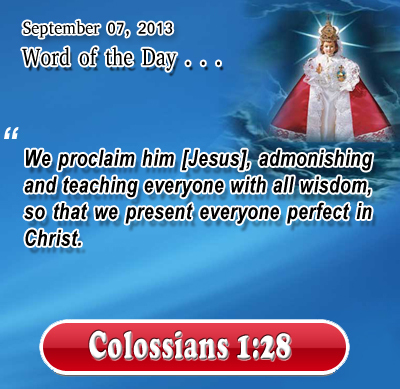 Colossians 1:28 We proclaim him [Jesus], admonishing and teaching everyone with all wisdom, so that we present everyone perfect in Christ." Holy Lord, conform our heart, our words, our life, our ministry, and our actions to those of Jesus. We want him to be our Lord, not just in our words but also in our life. In Infant Jesus' holy name we pray. Amen. 1On a Sabbath, while he was going through the grainfields, his disciples plucked and ate some heads of grain, rubbing them in their hands.2 But some of the Pharisees said, "Why are you doing what is not lawful to do on the Sabbath?" 3 And Jesus answered, "Have you not read what David did when he was hungry, he and those who were with him: 4 how he entered the house of God, and took and ate the bread of the Presence, which it is not lawful for any but the priests to eat, and also gave it to those with him?" 5 And he said to them, "The Son of man is lord of the Sabbath."